Praying Mantis, one of the founding bands of the movement in the UK in the early 80″s commonly referred to as NWOBHM (New Wave Of British Heavy Metal) are back with their new album “Sanctuary” six years since their last, “The Journey Goes On”. Still centered around founding members Chris and Tino Troy, new vocalist Mike Freeland is introduced into the mix on this album. 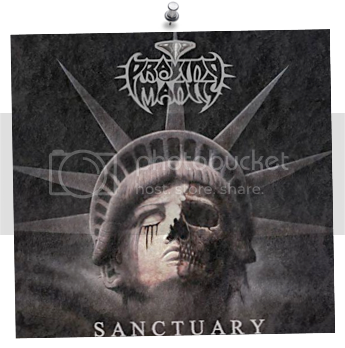 To sum it up, “Sanctuary” straddles the boundaries of melodic metal with a distinct European flavour, whilst containing elements of a classic British twin guitar assault, a heavy dose of AOR melodies and of course the trademarks of Praying Mantis. Produced by Andy Reilly (Asia, The Cult, Bruce Dickinson, FM) the album captures the essence of what Praying Mantis has always been about whilst putting a fresh modern and at times progressive spin on the bands sound. Opening song “In Time” begins with a soaring vocal which transcends into a power metal guitar riff, but don’t let that fool you as the chorus is gloriously melodic. A perfect sampler of what is to come with the rest of the album, the song ends with some killer instrumental guitar work that harks back to Whitesnake’s, Slip Of The Tongue, Steve Vai era. “Restless Heart” and “Highway” are the albums most melodic and accessible sounding tracks that are sure to appeal to those that revel in hook infested melodic AOR glory. Musically, the album borders on sheer brilliance. Blistering, yet at times delicate lead guitar work, British metal riffage, a driving rhythm section, songs drenched in keyboards and some complex musical arrangements. New vocalist Mike Freeland has slotted in incredibly well and whilst bringing a differen’t vocal sound to the band compared to those of the past, for the songs on this album one couldn’t wish for anything more than what Freeland delivers! Equally adept at hitting the high notes rising above blistering guitars such as on “So High” as he is on more restrained songs such as surely the albums centre piece, the majestic and grandiose “Turn The Tide”. With a CD cover depicting a decaying Statue Of Liberty, it would come as no surprise that the album does indeed head into some dark and powerful lyrical and musical destinations such as “Touch The Rainbow”, “Threshold Of A Dream” and “Playing God”. All songs which will certainly appeal to those Mantis fans harking back to the days of the NWOBHM movement or those that worship the classic rock sound made famous by the likes of classic era Rainbow. Whilst closing track “Sanctuary” ends on a more progressive note. This album has been one of the most unexpected finds of the year so far. For those willing to give this album the amount of listening and attention it deserves, you too will be rewarded with one of the most intricate and highest quality melodic metal releases for the year.